Presentation Plus is a complete planning and presentation tool for teachers. 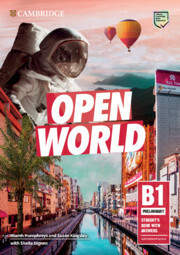 It includes Interactive Whiteboard software, complete course content, teacher resources, audio content and access to the Cambridge Learning Management System (CLMS), all on one easy-to-use platform. 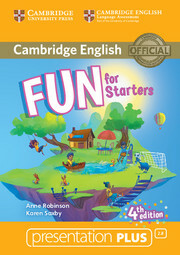 Fun for Starters Presentation Plus provides the complete content of the Student's Book, Teacher's Book and Class Audio, pop-up answers for visual activities, photocopiable and pairwork activities, word list, progress tests, a full Cambridge English: Starters practice test, plus access to online activities via the Cambridge Learning Management System (CLMS).